Signed Colts Flag giveaway! RT/Share and Follow/Like us to be automatically entered! - Very Barrie Colts | A website covering the Barrie Colts of the OHL. Home Barrie Colts blog Garcia Gibl. Giveaway Hooey jonathan laser Mackenzie Blackwood Signed Colts Flag giveaway! RT/Share and Follow/Like us to be automatically entered! Signed Colts Flag giveaway! RT/Share and Follow/Like us to be automatically entered! 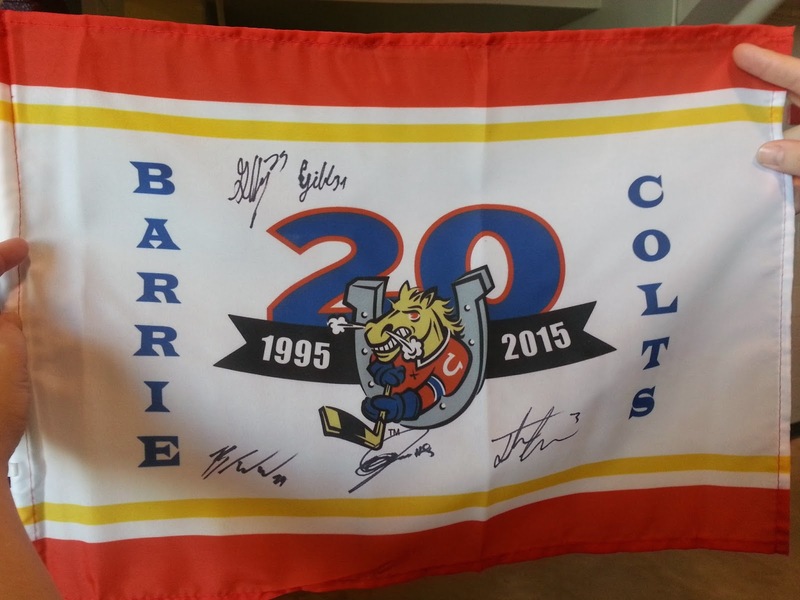 Want this signed Barrie Colts 20th anniversary flag? Signed by Laser, Garcia, Blackwood, Hooey and Gibl! Here is how you can win it! Or is it all? Don't think that will give you an edge to win? RT the tweet that this post was attached to to be entered a second time. And because I am feeling generous, and don't want to leave out our loyal followers on Facebook we will extend this to our Facebook page as well. Like us there and you will be entered again! Don't like us there already? Here is where you need to go! Very Barrie Colts Facebook. There is a chance to be entered 3 times! BUT WAIT!!!!! If you share this post on Facebook as well, you will be entered a 4th time! So that is pretty easy, right? The winner will be announced on Wednesday, September the 10th. We will either DM or message the winner on Facebook that night. We will make arrangements for how to get it to you. I will pay the shipping obviously if that is required, or we will make arrangements what work best for the winner. If you have any questions, feel free to message us on our FB or Twitter and we will respond as quickly as possible.